1st grade is one of the most important times in the success of a child’s reading. As parents, we expect our children to take a major step in developing their reading skills during this critical year. When this development falls short of these expectations, many parents are left wondering why and how they can help their child to succeed. When a child struggles to develop in reading, there is usually an underlying cause. Because of this underlying problem, the child does not learn to read well or even read at all regardless of how hard they try. A child needs to enter 1st grade with strong, well developed foundational skills for reading. When this foundation is improperly developed it will be difficult, if not impossible, to sound out or decode words. Reading becomes a frustrating and impossible task for the child. By the 2nd grade, a child can become so far behind in reading that every activity becomes a challenge and their self-esteem and confidence begin to suffer. Fortunately, whether your child is in 1st or 2nd grade, this reading foundation can be corrected in a few months by improving the underlying skills necessary for learning. These foundational learning skills are not at the academic level of learning. They are the foundational skills that are needed to learn the academics. At Think Smart Center we have had years of success in developing these underlying foundational skills. Auditory processing is one of these most crucial skills for reading and language expression. We specialize in developing these auditory skills as well as other important skills for reading. Once these learning skills are strengthened, this same student will be able to learn to read just as well or better than other students. Our Reading Program is an accelerated, “phonemic awareness” program that focuses on the crucial need to understand and hear reliably the sounds of a language before learning to read. This enables beginning readers and even non-readers to progress at an accelerated rate of learning. Even if your child is in 2nd grade and can not read, our reading programs accelerated rate of learning can catch them up with their class and in some cases even surpass their classmates. Multi-sensory methodology and instructional techniques help students make new brain connections that facilitate learning and boost skill retention. Unique learning techniques create a process that loads the new skills at the subconscious level enabling these skills to be automatic and permanent. Use of an extensive phonemic system teaches the student the sound codes for the 43 phonemes (individual sounds) of the English language as well as the alternative spellings for those sounds. By learning these sounds that make up our words, a child gains the skills for proper pronunciation and spelling of words. Each of the techniques have been rigorously tested for many years and proven to be the best approaches for struggling readers by leading experts in the field of education. Unfortunately, when children are not taught the reading code correctly, they end up either using an incorrect decoding system or have to develop their own. When equipped with the proper reading skills, your child can learn to read well. Once a student can sound out words properly and with fluency, reading comprehension improves. They no longer have to spend all their energy just trying to read the words. This allows them to begin to experience the joy that comes from reading. Specific drills and activities build the skills necessary for reading to become subconscious and automatic. This equips a child for more enjoyable, fluent reading. This is a very accelerated, therapeutic reading program administered by specialized private reading tutors. 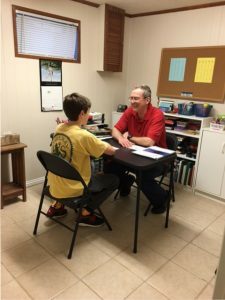 Our reading tutors are licensed, private reading tutors that are dedicated solely to your child using individualized tutoring rooms. This allows for a customized program to fit the specific needs of your child. See your child transform into a fluent reader who remembers and enjoys what they read.